1. Britt Eckertrom (Northwest) - Forget "freshman of the year." Many would say that Eckerstrom is the Montgomery County overall runner of the year. She was a consistent top finisher at high-powered invitationals including 3rd at the Paul Short Invitational, 2nd at Octoberfest, and 5th at Glory Days where she nearly broke the 18-minute mark for 5k. She was 3rd at the Montgomery County Championship, but did not lose to another county athlete after that. She won the 4A West Region Meet and placed 2nd at the 4A State Championship Meet in the fastest time by a Montgomery County athlete at Hereford in 7 years. 2. Chinyelu Asher (Holy Cross) - Asher was a late transfer to The Academy of the Holy Cross, but established herself as one of the best runners in the county when she won the WCAC JV race by nearly three minutes and placed 2nd in the MD/DC Private Schools State Championship in a time of 19:07. 3. Anna Bosse (Walter Johnson) - Like Eckerstrom, Bosse was counted on to be her team's top runner all season long. 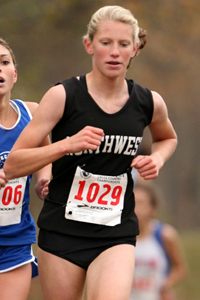 Her fastest time came at the Montgomery County Championship where she placed 17th in 19:39. She was the only freshman in the county to qualify individually for the MD State Championship. She placed 23rd overall at the state meet with one of her fastest times of the year, 20:28. 4. Sarah Sekscienski (Northwest) - Sekscienski became a crucial scoring member of the Northwest team when the upperclassmen started to go down with injuries. She more than filled the void with a 27th place finish at the Montgomery County Championship, 25th place finish at the 4A West Region, and 54th place finish at the MD State Championship. Her season best time of 20:41 earned her a 9th place finish at the Glory Days freshman race. 5. Vera Johne (Churchill) - Johne was a varsity member of the county champion Churchill team from the beginning of the season through the state championship. She consistently ran under 22 minutes with a season best time of 20:25 at the Meade Invitational. She placed 36th at the Montgomery County Championship in 21:22. 6. Melanie Stern (Whitman) - Stern earned a spot on the varsity roster after a big race at the Oatlands Invitational. She placed 42nd at the Montgomery County Championship with a season best time of 21:38. She later broke into the top 5 on her team at the 4A West Region Meet. 7. Maria Moersen (Walter Johnson) - Moersen was consistenly the #2 runner for WJ behind fellow freshman teammate Anna Bosse. The two freshmen are the foundation for the rebuilding WJ team. She placed 45th at the Montgomery County Championship in a time of 21:47. 8. Theresa Regan (Blair) - Regan began the season with a victory in the novice race at the Woodward Relays. She also won the freshman race at the Meade Invitational. She finished 54th at the Montgomery County Championship in a time of 22:04. 9. Abby Iacangelo (Sherwood) - Iacangelo began the season with some races over 25 minutes, but improved tremendously throughout the course of the season. She ran a season best 22:33 at the Montgomery County Championship and was Sherwood's #5 runner at the 4A West Region Championship where they qualified for the state championship with a tie breaker. Her time of 22:52 at the state meet was her 2nd fastest of the season. 10. Fatima Resendiz (Richard Montgomery) - Resendiz came on strong at the Meade Invitational with a sub-22 minute preformace. She followed that up with a 50th place finish in 21:58 at the Montgomery County Championship. That placed her 5th on her team, helping them finish 6th overall. How many runners are left from your first freshman board?